She is the widow of suicide bomber Germaine Lindsay, who killed 26 and injured 340 on July 7 2005 in London. Although initially condemning his attack, she later disappeared and was linked to a series of deadly Islamist operations across Kenya. In recent days it has been reported that UK security services have discovered that she is now hiding in Yemen. The sources said she recently visited Dubai and is plotting further attacks, including strikes on London, the Daily Mirror reported. The latest intelligence is said to have been gathered after an MI6 officer in Kenyan capital Nairobi recruited a source close to her. The information, described as “credible”, is believed to include allegations that she has a vast range of contacts in Yemen, particularly in the former British colony of Aden and the major seaport of Mukalla. Interpol issued a ‘Red Notice’ arrest warrant for her, indicating she is an international threat, after she was linked to the 2013 Westgate Mall attack in Kenya, which killed 71 and injured 200. She was also linked to the slaughter of 148 by gunmen at a Kenyan university in 2015. In Yemen, she is alleged to have recruited female suicide bombers. It is also reported she has altered her appearance through plastic surgery. However, her alleged group, Al-Shabaab, has publicly denied that she was involved in any frontline attacks, saying they had plenty of men for such operations. The claim is accepted as credible by several Islamist experts. Daily Telegraph correspondent Mike Pﬂanz investigated the “myth” around her in Kenya, concluding that it seems to have taken hold because it was “benefiting propagandists on both sides of East Africa’s growing rift between security and terror”. Samantha Lewthwaite was born to English soldier Andy Lewthwaite – who met and married Christine Allen while serving in Northern Ireland during the 1970s. She spent her childhood on the Whyte Acres estate in Banbridge and was still at primary school when her family moved to Aylesbury. 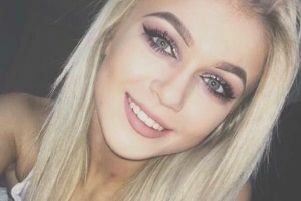 It is understood she has had little contact with relatives in Northern Ireland, including her 85-year-old grandmother Elizabeth Allen, since her conversion to Islam at 15. The Foriegn Office and PSNI declined to comment on the status of any current interest in her.